Tony Blair has dropped something of a bombshell by admitting that he would have favoured removing Saddam Hussein regardless of any arguments about whether Iraq had weapons of mass destruction. The admission, in an interview being broadcast on the BBC on Sunday, will convince cynics of British and American policy that they were right all along to say this was always about regime change. It might also make those who laboured to produce the evidence suddenly seem rather irrelevant. The former British prime minister's statement goes beyond simply saying that he did believe at the time that Saddam had such weapons but feels now that the war was right in any case. That is the conventional approach used by some people who supported the war and who think it produced a worthwhile result, though at a high price. Others have now changed their minds and say it was a mistake. Not Tony Blair. Typically, perhaps, he is not repentant. And more than that - he implies he would have gone to war anyway. (Update: I have had a couple of e-mails contesting two elements of this story. One says that Mr Blair did not actually say he would have gone to war anyway. However, his words are very close to making such a statement. And he went on to say that different arguments would have had to have been used, indicating that this is no idle thought. These were his words when asked if he would have "gone on" if he had known then there were no WMDs: "I would still have thought it right to remove him." You can see some hints of this approach in his speech to the House of Commons which debated the war and voted in favour of it. "To retreat now, I believe, would put at hazard all that we hold dearest. 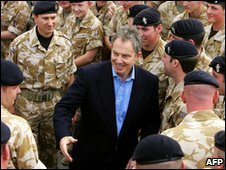 To turn the United Nations back into a talking shop; to stifle the first steps of progress in the Middle East; to leave the Iraqi people to the mercy of events over which we would have relinquished all power to influence for the better; to tell our allies that at the very moment of action, at the very moment when they need our determination, Britain faltered. I will not be party to such a course." It must be doubtful though whether the House of Commons would have supported a war without being told that Iraq was a major threat because of its weapons and Saddam's readiness to use them. And the US and UK could hardly have expected any backing from the Security Council. It was hard enough as it was. Just when Mr Blair decided that Saddam was such a threat that he had to go anyway is not clear. Sir John Sawers, his foreign policy adviser in early 2001, told the Iraq Inquiry that Mr Blair had not urged regime-change at that stage: "I don't recall a serious and considered challenge to the existing policy of containment," said Sir John, who has now gone on to be head of MI6. The inquiry has established that Mr Blair seems to have more or less made up his mind on action almost a year before the war was launched. The then British ambassador to Washington, Sir Christopher Meyer, spoke about a meeting at President Bush's ranch near at Crawford in Texas in April 2002: "To this day, I'm not entirely clear what degree of convergence was, if you like, signed in blood, at the Crawford ranch. "There are clues in the speech which Tony Blair gave the next day at College Station, which is one of his best foreign policy speeches. What you had in that speech at College Station was a rather sophisticated argument which said... 'Saddam is too dangerous'." 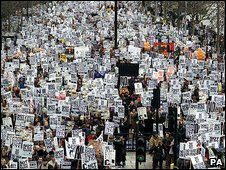 When he gives evidence to the inquiry himself, Mr Blair will no doubt be asked whether by then he cared less about the details of the supposed evidence for weapons of mass destruction and more about removing Saddam anyway.